Opened in 2009 our superbly appointed, fully accessible Clubhouse with large function room offers excellent catering and bar facilities and is available to hire at competitive rates. The modern, high quality decor; dance floor with stage area and outdoor balcony overlooking the course is perfect for weddings, christenings and others celebrations. Our delicious food and friendly, attentive staff combines to make your event a truly memorable one. We pride ourselves on delivering high levels of service with the experience we have gained over the years and a member of staff is always on hand to ensure your special occasion runs smoothly. In terms of flexibility for the package, we can offer as much or as little as you require. Seating and furniture arrangements are highly versatile and can be organised to meet individual requirements. There is also ample free on-site car parking for visitors and guests. With something to suit every budget and requirement, you are sure to find Blackley Golf Club the perfect host for your event bringing your celebration to life. 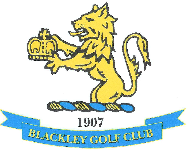 For a personalised service, just contact the Operations Manager on 0161 643 2980 or email: david@blackleygolfclub.com and see what we can offer.